Anarchy Online is a PC video game in the "massively multiplayer online role-playing game" (aka MMORPG) genre pioneered by Ultima Oline and EverQuest. It is set in a futuristic science-fiction world instead of in a medievalish fantasy world like its predecessors. This is a hugely complex game, with four different character races and fourteen different player professions. I know some players who have played for hundreds of hours and still feel like there is a lot to learn about the world of Rubi-Ka. It is my goal with these pages to help others benefit from some of the things I have learned along the way. The Armour Table shows a ranking of many (but not all) of the armor types available in the game. The methodology that Funcom used to add new armours to the game with ShadowLands was significantly more complicated than the old formula, so generating a table by hand as I used to do is not realistic anymore. I just have to get around to writing a program to automatically generate the table from the database. 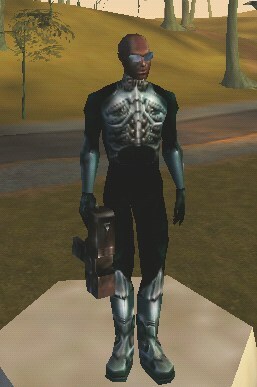 My Sample Plan for Installing QL200 Implants at early levels was how I got my level 88 Fixer into high level implants. ShadowLands has made implanting even easier since this was done, with perks, garden keys, Visionist tools and other treatment boosting items. It also added symbiants, which if planned carefully can be superior to using QL200 implants starting around character level 81. This document will still help you understand how to use implants and items to step to higher quality implants and symbiants. 10 of 13 QL200 implants on a level 97 Atrox Enforcer. Bima's Fixer Implant layout is my recommendation of a good implant layout for Fixers. A catalogue of the premade implants that are available in basic general stores. A comparison of symbiants for each profession. Equipping a T.I.M. Scope describes various options available to equip the special scope dropped by T.I.M. in Biomare without having to spend IP on Rifle or Aimed Shot skill. An explanation of How Trickle-Down Works. An explanation of How Inits Work. My guide to the Penumbra Redeeemed Garden Key quest. Link goes off-site to the Dark Crusaders' bulletin board. My guide to the Penumbra Redeeemed Sanctuary Key quest. Link goes off-site to the Dark Crusaders' bulletin board. level is a Perl script that calculates both what missions can be pulled by a character of a particular level, and what character levels can pull a particular mission level. wrangle is a Perl script that figures out a trader's best drains and wrangles based on their starting PsychoMod / Time & Space skill. A comparion of the upgraded weapons in the ICC Backyard, for those trying to make the most out of their time there. Implant QLs was created for the same reason. Nano Nanny is vitally important to any implant designer and I use it regularly, but unfortunately it tends to be consistently wrong on two different important areas. It generally reports a treatment requirement that is lower than the real requirement, and also says that the bonus for the bright spot is lower than it really is. So I started putting this file together with information based on the stats of implants that are actually in the game. There are many holes in the data, but the information has still been very useful to me. The Item Datatabase at AntiGuardians was an invaluable tool in putting a lot of this information together. There are many other useful tools at the AntiGuardians' Stuff page, including the best lists of nanoprograms for each profession that I have seen yet. I am extremely grateful to Auno for putting that site together. Jayde's Item Database provides a different interface to the items in the game. It is also very useful, able to find many NPC items that affect gameplay, such as what attacks various pets use, and lists some additional details about some items that Auno's database interface does not have. If you "View Strain" for nanoformulae you will be able to tell which nanos won't stack with each other (and, by inference, which ones will). Kimi's Anarchy Online Resources has two very useful features. One is a compilation of items that have recently been posted for sale in the Atlantean or Rimor market channels. The other is listings of nanos by profession that indicate whether a nano is rollable as a mission reward or drops as loot from a boss or unique. Boss camp locations, at AO Stratics. I'd been making a list at this site but never really finished it. These are a bit obsolete, but I have kept them for historical records. The AO Damage Dumper program, to tally the damage done by you and your teammates. Changes to the chat system made this obsolete. Option names for the various chat options you can set. Changes to the chat system made this obsolete. Core Abilities includes the many ways I know of to use items or nanoprograms to raise various skills, in particular the six core abilities of Strength, Stamina, Agility, Intelligence, Sense and Psychic, as well as the six nanoprogram skills of Biological Metamorphosis, Material Metamorphosis, Material Creation, Psychological Modifications, Sensory Improvement and Time & Space. This research was done to figure out the best way to get myself into the highest quality implants I could. However, it has been neglected since that point and so does not include many new items that boost abilities. Jayde has added a nice tool to list buffing items over at Anarchy Mainframe. The Infusion Plan was for figuring out my metaphycisist's change to psymod/senseimp implants so he could use infusions at the earliest possible level. This was the real motivation for Core Abilities and Implant QLs lists. It also is somewhat dated as many items added in later patches would have changed how I did it (and gotten better implants in even sooner). With the introduction of symbiants, this is essentially now a choice an MP does not need to make as switching to symbiants for Head, Eye, and Right Hand will allow maxed PM/SI at the same time as maxed MC/TS. soe-buds, an AO script to add all the members of our guild, Souls of Eternity, to the Friends list. Updated daily. When I started playing AO in February 2002, I thought I would stick with just one character but rather soon decided I wanted to try out each of the races and most of the professions to see what each had to offer. They are listed below in the order I created them. Many were created just to have a character to play at a comparable level to friends, so I could team up with them. I also have a few more rarely played characters to fill out the full set of professions. Moonstride, Clan Solitus Martial Artist. Laslingis was intended to be my main character, but like many first characters people play, I made a lot of stupid choices with him and wasted a lot of skill points down stupid paths. His combat abilities were not so great, and regular combat is the only meaningful way to gain levels unfortunately. The skill reset that was available to all players for a few weeks helped him a lot, skill-wise, but at the moment he isn't capturing my interest as someone I want to actively play, even though I'd like to get his levels up more to improve his ability to buff others. Golly was very useful at low levels because he is a tank. He can stand in the front row of the battle and take a lot of punishment as teammates stay back unharmed. I fear he might not be too great at higher levels, though, as other classes have spells that will severely hamper his melee attacks. I also developed him badly for a little while because I didn't really fully understand the game mechanics. The skill reset was very helpful, since I was able to set him up much better with the knowledge I'd gained about the game. He is a lot more fun to play now. Each breed and class has its strong points and weak points. They all seem to be very well balanced when combined in teams. Props to my friend Ashram who was a huge help in getting me acclimated to the game, spending many hours by my side as Greymatta, a high level metaphysicist who showed me the ropes and kept me healed in battle. I used to have several screenshot thumbnails on this page, but have moved them to their own page to speed loading here. I also have some screenshots of bugs on another page.